If you loved SSSO’s Elemental performance last Sunday, you won’t want to miss our next one – ‘Music in the Air’! 7:00pm Saturday 25 May at Mt Pleasant Baptist College 497 Marmion St Booragoon. Amazing music and soloists including Naomi Johns – soprano, Jun Zhang – tenor, Robert Hofmann – Baritone, Isabelle Chen – violin and Joshua Chen – piano and cello. 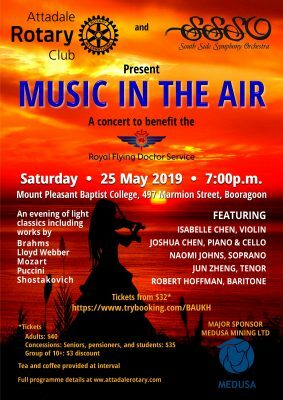 All proceeds to Royal Flying Doctor Service, WA.